I absolutely love this speaker! The sound is amazing and carries really well. I live on a small one acre property and turned up, I can pretty much hear it anywhere. It does have a bit of weight to it but it has wheels and a handle which comes in very handy. It keeps a charge for hours. The USB and other plugins are a really nice feature as well, like having a portable battery pack. There’s only one complaint if you can call it that. It has a NOAA weather feature that alerts you to weather changes or something to effect. You have to shut it off or you will occasionally get a very loud disruptive alarm. There wasn’t much explanation in the manual for that. Click the volume button until it is NOFF and you’ll be good to go. Long story short- this did NOT disappoint and if you’re on the fence step on over because this speaker is awesome. Monster Rockin-Roller Portable Indoor/Outdoor Bluetooth Speaker. The latest wireless Bluetooth speaker for indoors and outdoors in the Monster Rockin’ series. It’s not just another Rockin’ Roller – it’s an entirely updated product. With True Wireless Stereo (TWS), you can connect and sync audio with two speakers at once. Connect any TWS-compatible speaker and double your audio output! Built-in NOAA Weather Radio (NWR) for local weather hazard reports. WHAT’S IN THE BOX: Rockin RollerX, Warranty Manual, AC Power Cable, Wired Microphone and Aux cable. Dimensions 9.05 In. X 16.7 In. X 20.6 In. 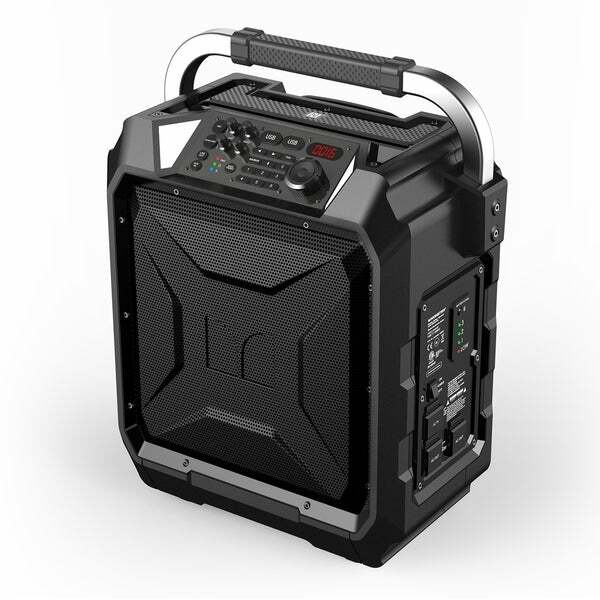 My Monster Rockin Roller X is a powerful indoor/outdoor Bluetooth speaker that delivers crisp audio and hard bass with 100 watts of power. With True Wireless Stereo (TWS), you can connect two speakers at a time. I love it. Best Bluetooth speaker I have ever heard. It’s bass response is awesome I have used it on the job for a week 8 hours a day and it’s still charged. The ease of use, construction, and sound quality is exactly what I have come to expect from Monster. Too small for a block party, but plenty big enough for a tailgate or day at the beach. We bought this for our son for Christmas and he loves it. High quality sound and lots of options. The adjustable handles and wheels make for easy transport. It has awesome sound quality and is very well built.